This article is about the Carmen Sandiego franchise. For the character, see Carmen Sandiego (character). For the game series, see Carmen Sandiego (game series). For other media called "Carmen Sandiego", see Carmen Sandiego (disambiguation). Where in the World of Music Is Carmen Sandiego? Carmen Sandiego (sometimes referred to as Where in the World Is Carmen Sandiego?) is a media franchise based on a series of computer games created by the American software company Broderbund. While the original 1985 Where in the World Is Carmen Sandiego? video game was classified as a "mystery exploration" series by creators and the media, the series would later be deemed edutainment when the games became unexpectedly popular in classrooms. The franchise centers around the fictional thieving villain of the same name, who is the ringleader of the criminal organization, V.I.L.E. ; the protagonists (most often including a computer player) are agents of the ACME Detective Agency who try to thwart the crooks' plans to steal treasures from around the world, while the later ultimate goal is to capture Carmen Sandiego herself. The franchise primarily focuses on teaching children geography, but has also branched out into history, mathematics, language arts, and other subjects. An attempt was made to create a series of state-specific games in the 1980s, but the only prototype to be completed was North Dakota. Beginning in 1988, Carmen Sandiego Days became popular across American public schools. In the 1990s, the franchise extended into three television shows, books and comics, board games, a concert series, two planetarium shows, and two music albums. Towards the turn of the 21st century, the Carmen Sandiego property passed through a series of five corporate hands: Broderbund (1985-1997), The Learning Company (1998), Mattel (1999), The Gores Group (2000), and Riverdeep (2001–present). Subsequent acquisitions and mergers of Riverdeep led to the franchise currently being in the possession of Houghton Mifflin Harcourt. For the next 15 years, the series would become mostly dormant despite a few licensed games. In 2017, soon after Netflix commissioned an animated show based on the property, HMH hired Brandginuity to reboot Carmen Sandiego through a licensing program built around the show and the franchise as a whole including toys, games, and apparel. HMH Productions, established in 2018, is currently the content incubator, production company, and brand manager of Carmen Sandiego and has three Netflix projects in the works: season 1 of an animated show (January 2019), an animated interactive special (Late 2019), and a live-action film. The 30th anniversary of the first Carmen Sandiego Day took place on January 8, 2019. The franchise has become known for its ability to surreptitiously teach facts, breed empathy for other cultures, and develop logic skills, all behind a mask of highly entertaining detective mystery experiences. One aspect of the series that has received consistent praise by critics is its diverse representation of strong, independent, and intelligent minority women. Carmen Sandiego herself is Hispanic, and it has never been implied that her ethnicity is correlated to her thievery. Meanwhile, The Chief from the World game show was African American, an unusual choice for children's television when she appeared between 1991 and 1996. These two characters have helped to bring such representations into the mainstream and demonstrate leadership roles for young women. It has been noted that many of the geographical locations at the time of the franchise's release were no longer accurate, due to the events such as the dissolutions of the Soviet Union, Yugoslavia, and Czechoslovakia that signalled the end of the Cold War. Carmen Sandiego has maintained a considerable popularity and commercial success over its history. Carmen Sandiego is one of the top 30 longest-running video game series, having existed for just over 30 years with the release of Returns in 2015. By 1997, Carmen Sandiego games had been translated into three different languages, and over 5 million copies had been sold into schools and homes worldwide. All three television shows have together been nominated for 45 Daytime Emmy Awards (winning 8), while World also won a Peabody Award. They had a combined viewing audience of over 10 million viewers each week. The franchise will continue on television with the premiere of a eponymous Netflix series, which premiered on January 18, 2019. See also: Development of Where in the World Is Carmen Sandiego? The original game idea started in 1983 from Broderbund programmer Dane Bigham, wanting to take the idea of text adventure games like Colossal Cave Adventure, but create a menu-driven interface to be played on the Apple II computer. Initial work was done with Broderbund's "Rubber Room" artists, Gene Portwood and Lauren Elliott, creating a game where the player would chase down various crooks. Broderbund co-founder Gary Carlston suggested changing the concept to be focused on geography, anticipating shipping copies of The World Almanac to let players research clues and find the right answers for geography questions. As Bigham was not thrilled with this direction, he focused more on the interface, and Carlston hired David Siefkin to write the game's story. Siefkin came up with the idea of the player tracking down numerous criminals, and developed several criminal personas, including Carmen Sandiego. The other staff found this name mysterious and exotic, in addition to being a female character they could use to attract younger women to the game. From Siefkin's script, they expanded out the idea of the criminal organization V.I.L.E. - Villains’ International League of Evil – and the ACME Detective Agency – with ACME jokingly considered an initialism for "A Company that Makes Everything". The core gameplay was then established, having the player as an ACME recruit to chase down underlings within V.I.L.E., following geography-based clues to complete their search, and working up their ranks in ACME until they were tasked to go after Carmen herself. The game proved successful, unexpected from the educational market, as it became a staple in many classrooms. "I think the problem is that geography, like far too many things, is presented as dry and dull and boring by people who must have personally found it that way. I don't think it has to be ... We don't use the word 'educational' anywhere on any of our products. The term translates into 'boring' in kidspeak. I prefer 'explorational'". During the 1980s and the 1990s, Broderbund followed the first Carmen Sandiego video game with U.S.A., Europe, Time, America's Past, Space, and Junior Detective, reboots of World, U.S.A., and Great Chase Through Time, and finally released Word Detective and Math Detective. The first seven games of the franchise were each awarded one or more SPA Excellence in Software Awards, particularly for their educational effort. Carmen Sandiego games comprised 25% of Brøderbund's total revenue in 1992, behind only The Print Shop. By 1997, Carmen Sandiego games had been translated into three different languages and over 5 million copies had been sold into schools and homes, worldwide. Carmen Sandiego also appeared in three television shows during this era. The World game show was broadcast on PBS between 1991 and 1996 and won six Daytime Emmy Awards and a Peabody Award. World was followed by Time, which would later aired up until its cancellation in 1998 due to the geography-based premise having "run its entire course". It was acknowledged that history can be more subjective than geography, but the show hoped to tackle challenging material like the Japanese American internment camps during World War II in a straightforward and educational way. The Earth animated series was broadcast on FOX between 1994 and 1999. In 1996, President Bill Clinton stated: "When I met the co-leaders of San Marino at the Olympics, I knew where it was because of Carmen Sandiego". After Brøderbund ceased to exist in 1998, The Learning Company apparently sought to redesign the series. The company determined that the brand was stagnating but thought it easier to revive an established brand than start a new one. Under The Learning Company, the series seems to take its premise more seriously and uses character-based humor. Since The Learning Company has only created two Carmen Sandiego games, one of which is no longer sold. This change is evident mainly through the marketing of select Brøderbund products. The first title released by The Learning Company was ThinkQuick Challenge, a quiz game with a similar tonality to Word Detective and Math Detective, which included the reappearance of Chase Devineaux. The new structure of Time was apparently to The Learning Company's liking since their new version of World, titled Treasures of Knowledge, was similar. The Learning Company decided to return the series to its original focus on geography, discontinuing Word Detective, Math Detective, and ThinkQuick Challenge. In 2004, Bam! Entertainment released The Secret of the Stolen Drums on the GameCube, Xbox, and PlayStation 2. It is so far the only game of the franchise to use real-time 3D computer graphics, although many previous games had used pre-rendered 3D graphics. It was also an action game and while geographical facts were included, learning them was not necessary to complete the game. Although The Learning Company evidently licensed the use of the series as well as some of their own characters from Treasures of Knowledge, this game is not distributed by or sold under The Learning Company name. An upcoming Netflix series called Carmen Sandiego is scheduled to air in 2019. This was the PBS game show designed for children ages 8–12. The World game show was staged in a slightly off-skew detective office, which was part of the ACME agency with Lynne Thigpen portraying "The Chief" and Greg Lee portraying himself as a special agent in charge of training new recruits. Greg was helped in this training by various live-action and animated characters. Among the show's most popular were the members of the a cappella house band and comedy troupe, Rockapella, who also sang the show's main theme song. The game was played in three rounds: the first round was Q&A, where the two gumshoes with the highest scores proceeded to a second round. In the second round, the two remaining gumshoes had to find the loot, the warrant, and the cartoon crook in the correct order. The winning gumshoe captured the day's crook and later advanced to the third and final round to capture Carmen. As Greg shouted the names or places in a region of the world, the gumshoe had to place a marker on the corresponding place on a giant map of that area within a 45-second time limit. A successful gumshoe who placed all the correct locations and captured Carmen would win a trip to anywhere in the contiguous United States and later in North America. The Time game show refocused the show on history, but was otherwise similar to World with Thigpen reprising her role as "The Chief". Kevin Shinick portrayed himself as a Time Pilot Squadron Leader and Rockapella was replaced by a different dance group, The Engine Crew. The third and final round of the game involved the pilot answering six various history-related questions to open time gates. If the pilot answered correctly, he/she passed through the gate. Otherwise, the pilot had to turn a crank, pull a lever, or do some other task within the 90-second time limit. A successful pilot who passed through all six gates and captured Carmen would win a personal computer. Main article: Where on Earth Is Carmen Sandiego? The Earth animated series was a Saturday morning cartoon series produced by DIC Entertainment. The series features the adventures of Zack and Ivy, two teenage siblings who worked as ACME agents in San Francisco and were aided by the Max Headroom-like Chief, who had to stop Carmen (voiced by Rita Moreno) and her henchmen from stealing artifacts from around the world. The series was the first Saturday-morning children's program ever to win the "Best Animated Program" Emmy in 1996. Its episodes have subsequently been repeated on the Fox Family Channel, the Pax network, Hub TV, and Univision. The first season was released on DVD by Shout! Factory in 2006 and the complete series was later released by Mill Creek Entertainment in 2012. The second animated series is produced by Netflix. In this series, it follows the adventures of "Carmen Sandiego" an orphan girl who is recruited to V.I.L.E. as a master thief, only to turn against them and seek to undo their thievery. In the early 1990s, in response to the successful Carmen Sandiego franchise, "editor Sharon Shavers was tasked with turning the games into a book series". She gave the responsibility to John Peel. His research consisted of playing all the games, and this was followed by "Sharon and [him] work[ing] out a format for the series" before he commenced writing. While in the past his natural tendency to add jokes to his work had been looked down upon, "Sharon [actually] asked [him] to put more in". The art was done by Allan Neuwirth. The premise of each choose-your-own-adventure book is that "you are the detective", and each title features "four exciting detective adventures inside!". The books are written in the second person and in present tense, and have removable inserts that provided clues and the identities of the villains. The books are published by the Canadian branch of Golden Books Publishing. Where In America Is Carmen Sandiego? (1992) – this title was, as opposed to the others, "a picture book like Where's Waldo? ", and the only picture book Peel ever wrote. Where Is Carmen Sandiego? Calendar (1993) – this title was written for Workman Publishing, and Peel considers it "the strangest – and most difficult – writing job [he] ever had"
From mid 1996 to early 1997, four Carmen Sandiego comic books were published by DC in a series entitled Where in the World is Carmen Sandiego?. They involved the exploits of Evan Sawyer, "Acme Detective Agency's newest and youngest gumshoe". University Games published a number of board games, and at least one card game, based on Carmen Sandiego throughout the 1990s. 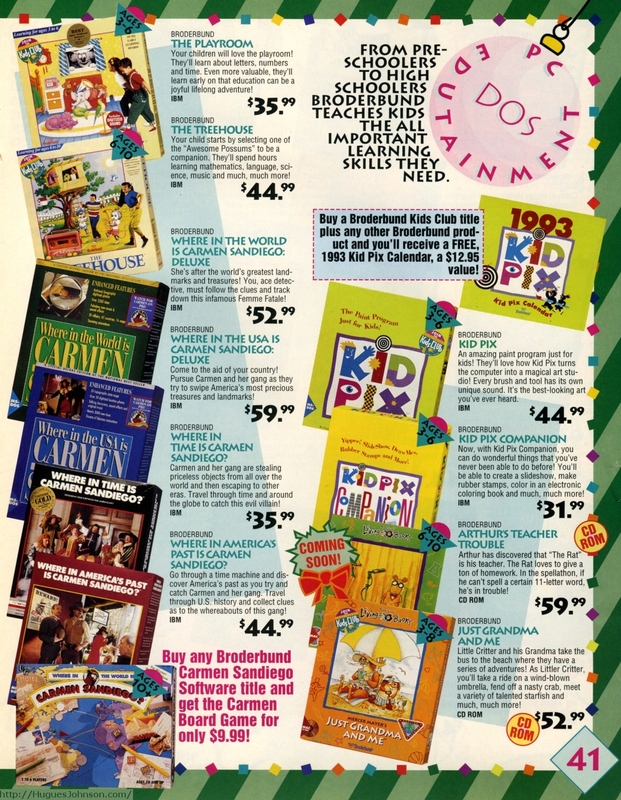 To promote the first board game, Broderbund made a special offer around Christmas when any Carmen Sandiego video game was purchased in tandem. Where in Time is Carmen Sandiego? card game. The game has two parts. First, players collect clues to work out which of Carmen's henchmen stole the landmark. Afterwards, players race to see who can catch the crook first. Main article: Where in the Universe is Carmen Sandiego? Where in the Universe Is Carmen Sandiego? is a movie that was made to be played in a planetarium. It is less like a traditional movie, and more like one of the Carmen Sandiego game shows featured on PBS with the live audience as the detectives. This film also featured Lynne Thigpen as "The Chief" and was based on Where in Space Is Carmen Sandiego?. This marked Thigpen's final appearance of the franchise before her death of a cerebral hemorrhage on March 12, 2003. A sequel was later created called Where in the Universe is Carmen Sandiego? - II. Main article: Where in the World of Music is Carmen Sandiego? Where in the World of Music is Carmen Sandiego? is a concert series developed by Gary Sheldon. It consists of 3 concerts: The Case of the Missing Concert Hall, The Case of the Missing Bells, and The Case of the Missing Pyramids. Walt Disney Pictures were planning to make a film version of "Carmen Sandiego", with Sandra Bullock as the title character in the late 1990s. Walden Media has planned to make a live action version of the film with Jennifer Lopez as both Carmen Sandiego and producer of the film with her production company Nuyorican Productions. Writer Darren Lemke (Jack the Giant Slayer) has been attached to write the screenplay in July 2012. In the late 1990s, the Metro Washington Park Zoo in Portland, Oregon, (now the Oregon Zoo), in conjunction with Brøderbund, ran a summer-long event titled Where in the Zoo Is Carmen Sandiego?, which functioned as a full-immersion live-action Carmen game in which zoo patrons were the investigating detectives. Actors were hired to play Carmen's henchmen, who could be found around the zoo, and on occasions a costumed Carmen appeared as well, but never in a location where patrons could interact with her. Clues were given out at various stations by members of the ZooTeens volunteer group. In 2016, NPR held an homage to the WinWiCS gameshow entitled Where in the Mall is Carmen Sandiego? in which incoming theft reports from ACME CrimeNet are relayed to contestants who must then work out which store in the mall is being referred to. It was part of the podcast called NPR Programs: Ask Me Another. The Carmen Sandiego Licensing Program saw the Carmen Sandiego brand licensed to over 20 companies including Harper Collins, University Games, Great American Puzzle Factory, DIC Entertainment, WGBH/WQED, Micro Games of America, Publications International and Troll Associates. The Carmen Sandiego Connection website allowed players and fans to discover more about the franchise. Pacific Bell Carmen Sandiego Prepaid Phone Cards were made available. The commercial success of Carmen Sandiego is due in part to its intrinsic fantasy that makes the game both fun and educational. The skill and the fantasy are intertwined, resulting in a much more engaging experience. When playing educational games with intrinsic fantasies, the users are more motivated to apply their educational skills because it feels natural, not arbitrary. —  Craig Brannon, Legacy Software Director of Education, "Making Things Fun to Learn: Principles of Edutainment Design " presentation at the 1997 Computer Game Developers' Conference. The series as a whole has been met with critical acclaim, although most of the games released after Broderbund was sold to The Learning Company have received mixed to bad reviews. A review by Mr. Bill & Lela for Mr. Bill's Adventureland Review  says of the 1996 game Where in the World Is Carmen Sandiego? "It teaches knowledge of world geography and cultures, electronic database research skills, map reading and deductive reasoning. This game became so popular that there is a whole series of them out now: Where in the USA, Where in Time, etc. It's a great game and one that is often used in schools today." The 1991 document Three Instructional Approaches to Carmen Sandiego Software Series outlined three ways in which the Carmen Sandiego series could be utilized in an educational context: turning teacher instruction into a gamified cooperative/competitive experience, linking the previously discrete academic topics, and not playing it in its entirety but isolating segments for lessons on particular items. The 1994 journal article "The impact of a computer-based adventure game on achievement and attitudes in geography" by J. H. Wiebe and N. J. Martin found that there were no "significant differences in recall of geography facts or attitudes between the teaching methods" of the computer game Where in the World is Carmen Sandiego? and a "non-computer-based board-style geography game". Kotaku explains the duality of the franchise thus: "In concept, it [is] a light edutainment game. In practice, it [is] a gateway to the rest of the world." The Educational Technology Handbook says that the series "engage[s] youth in tracking elusive villains across the earth". It suggest that the many games in the franchise "...hold your child's interest by putting them in touch with real-life places and events in a way no formal history or geography lesson can match". From Barbie to Mortal Kombat: Gender and Computer Games suggests that software games like Where in the World is Carmen Sandiego? challenge ideas of gender stereotypes in regard to games, due to it "hav[ing] equal appeal for boys and girls". In 2001, the Los Angeles Times said "even the most sophisticated recent titles have a hard time competing with Carmen Sandiego, the grand dame of teaching kids where in the world they are". The Stanford paper "Why in the World is Carmen Sandiego a Success?" by Todd Brown explained the long-lasting appeal of the series: "Ultimately, the keyfactor of success for the Carmen series has been cultural. The designers were able to appeal to all children, boys and girls, by developing an experience with something for everyone. Goals, conversations, intrigue, suspense, learning geography... it’s all there. Furthermore, they did it without just shoving a geography lesson down kids’ throats and without talking down to them either". He quoted Elliott, who said "We don’t use small words. Kids are short but not stupid", and concluded "By treating children as the intelligent little people they are, the designers had no need to hide from them the fact that they were playing and learning at the same time. Kids knew. The beauty of Carmen Sandiego is that they kept playing anyway." ^ "Carmen Sandiego". Netflix Media Center. Retrieved 2017-04-27. ^ Ahoy! Magazine Issue 43. July 1987. ^ a b Bernstein, Sharon (1991-09-30). "PBS Game Show Charts New Territory". LA Times. Retrieved 2010-08-25. ^ Lewis, Peter H. (1989-04-09). "A Hard Look at Software". The New York Times. Retrieved 2010-08-25. ^ Martin, Douglas (2000-07-30). "Raymond Portwood Jr., Computer Game Pioneer, Dies at 66". The New York Times. Retrieved 2010-08-25. ^ "Brandgenuity to Rep 'Carmen Sandiego'". License Global. 2017-05-17. Retrieved 2018-12-27. ^ "HMH Productions | Houghton Mifflin Harcourt | HMH Books". www.hmhbooks.com. Retrieved 2018-12-27. ^ a b "Nostalgia Time: Where in the World is Carmen Sandiego?". Archived from the original on 2017-08-02. Retrieved 2017-05-06. ^ Francis, Bryant. "Where in the world did blockbuster educational games go?". Retrieved 2017-08-26. ^ a b c d e f g Inc., Peter N. Skram, Bedrock Media,. "Carmen Sandiego Connection – Find Carmen!". web-beta.archive.org. Archived from the original on 1997-05-30. Retrieved 2017-03-05. ^ a b Craddock, David (September 15, 2017). "The Making Of Carmen Sandiego". Kotaku. Retrieved September 15, 2017. ^ "The Print Shop Still Prints Money At Broderbund Software". Computer Gaming World. February 1993. p. 82. Retrieved 6 July 2014. ^ "Brownsville Herald Newspaper Archives, Oct 21, 1996, p. 13| NewspaperArchive®". newspaperarchive.com. Retrieved 2017-05-03. ^ "Garden City Telegram Newspaper Archives, Oct 26, 1996, p. 32| NewspaperArchive®". newspaperarchive.com. Retrieved 2017-05-03. ^ "History Trivia Carmen Sandiego Is Helping Kids Learn About History In A New Game Show Format". Spokesman.com. Retrieved 2017-05-03. ^ "Santa Ana Orange County Register Sunday Newspaper Archives, Oct 11, 1998, p. 110| NewspaperArchive®". newspaperarchive.com. Retrieved 2017-05-03. ^ Mangan, Jennifer (1994-05-04). "'Educating Rita". Chicago Tribune. Retrieved 2010-10-02. ^ "The History of". Carmen Sandiego. 2012-01-09. Retrieved 2013-02-12. ^ "DVD Review: Where on Earth Is Carmen Sandiego?". The Trades. Archived from the original on 2010-03-16. Retrieved 2010-10-02. ^ "Carmen Sandiego". john-peel.com. Retrieved October 27, 2012. ^ "notebook16a". flickr. Retrieved October 27, 2012. ^ Where in Time Is Carmen Sandiego. Golden Books Publishing (Canada). December 7, 1993. ISBN 978-0-307-22204-6. Retrieved October 27, 2012. ^ Inc., Peter N. Skram, Bedrock Media,. "Carmen Sandiego Connection – Get the Goods". web-beta.archive.org. Archived from the original on 1997-05-30. Retrieved 2017-03-05. ^ "EB Christmas 92', Page 41". Retrieved 2017-03-27. ^ "Where in Time is Carmen Sandiego?". Gamebooks.org. Retrieved 2013-02-12. ^ "Where in the World is Carmen Sandiego? (1992)". BoardGameGeek. Retrieved October 27, 2012. ^ "Where in the USA is Carmen Sandiego? (1993)". BoardGameGeek. Retrieved October 27, 2012. ^ "Where In The World is Carmen Sandiego? Card Game (1993)". BoardGameGeek. Retrieved October 27, 2012. ^ "Where in the World is Carmen Sandiego? Junior Detective Edition (1994)". BoardGameGeek. Retrieved October 27, 2012. ^ "Where in Space is Carmen Sandiego (1995)". BoardGameGeek. Retrieved October 27, 2012. ^ "Where in Time Is Carmen Sandiego (1996)". BoardGameGeek. Retrieved October 27, 2012. ^ "Walden Media And Jennifer Lopez Team Up On 'Carmen Sandiego'". Deadline Hollywood. 2011-11-03. Retrieved 2011-11-03. ^ "Young People's Theatre Project". Yptproject.org. Retrieved 2011-02-03. ^ Odesser-Torpey, Marilyn; Piantanida, Maria (1999-06-01). Philadelphia: 24 Weekend Get-a-Ways from the City of Brotherly Love. Globe Pequot Press. ISBN 978-0-7627-0444-6. ^ a b Zavatsky, George; Zavatsky, Michele (2000-02-01). Kids Love Pennsylvania: A Parent's Guide to Exploring Fun Places in Pennsylvania With Children... Year Rould!. Kids Love Publications. ISBN 978-0-9663457-2-8. ^ "Where In The Mall Is Carmen Sandiego?". www.wbur.org. Retrieved 2016-08-02. ^ "Where In The Mall Is Carmen Sandiego?". NPR.org. Retrieved 2016-08-02. ^ a b "Press Releases". web-beta.archive.org. Archived from the original on 1997-04-12. Retrieved 2017-03-05. ^ "Carmen Sandiego Connection, About Carmen Sandiego". web-beta.archive.org. Archived from the original on 1999-04-22. Retrieved 2017-03-05. ^ "Carmen Sandiego Connection, About Carmen Sandiego books, magazines, games, and puzzles". web-beta.archive.org. Archived from the original on 1998-12-02. Retrieved 2017-03-05. ^ Padilla, Veronica. "Yakima youth have back-to-school fun with 'Where in the Valley is Carmen Sandiego?'". Retrieved 2017-08-27. ^ "Where in the valley is Carmen Sandiego?". Retrieved 2017-08-27. ^ Sosa, Karla (2017-08-19). "Kids enjoy "Where is the Valley is Carmen Sandiego" scavenger hunt before going back to school". KVEW. Retrieved 2017-08-27. ^ Inc., Peter N. Skram, Bedrock Media,. "Carmen Sandiego Connection – Spy the Software". web-beta.archive.org. Archived from the original on 1997-05-30. Retrieved 2017-03-05. ^ "Carmen Sandiego Connection, About Carmen Sandiego". 2000-09-03. Archived from the original on 2000-09-03. Retrieved 2017-03-05. ^ "WHERE IN THE WORLD Is Carmen SANDIEGO Review – Mr. Bill's Adventureland". Mrbillsadventureland.com. Retrieved 2011-02-03. ^ Alexandra, Heather. "Why In The World People Love Carmen Sandiego". Kotaku. Retrieved 2017-04-20. ^ Hackbarth, Steven (1996). The Educational Technology Handbook:. pp. 119, 223. ISBN 978-0-87778-292-6. Retrieved November 14, 2012. ^ Cassell, Justine (2000-02-28). From Barbie to Mortal Kombat: Gender and Computer Games. p. 90. ISBN 978-0-262-53168-9. Retrieved November 14, 2012. ^ Gudmundsen, Jinny (2001-02-22). "Where in the World Is the Perfect Kids' Geography Game?". Retrieved November 14, 2012. Look up Appendix:Carmen Sandiego in Wiktionary, the free dictionary. Carmen Sandiego at Don Markstein's Toonopedia. Archived from the original on April 13, 2012. This page was last edited on 6 March 2019, at 21:15 (UTC).